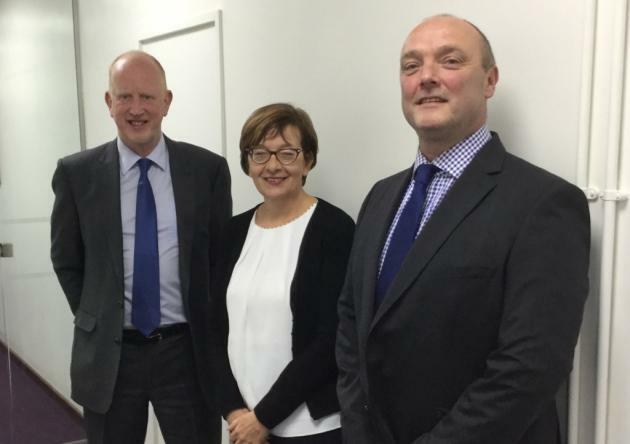 Tony Hull, left, current Chief Executive of the Evolution Academy Trust, with Sue Baldwin, Regional Schools Commissioner for the area, and Mark Adamson, Mr Hull’s replacement. After decades in the classroom, Tony Hull is stepping away from education, and his role at the Evolution Academy Trust. Lauren Cope spoke to the outgoing chief executive – and met his replacement. It has been the better part of two decades since Tony Hull and Mark Adamson last worked together. In the early 2000s, the pair, as Head and Deputy Head, oversaw a transformation at St Michael’s Junior School in Bowthorpe that prompted watchdog Ofsted to label the pair one of the most dynamic leadership teams in the country. Now, years later, they are once again working side by side, this time as Mr Adamson prepares to take over the mantle of Chief Executive at the Evolution Academy Trust (EAT). One of Norfolk’s most established trusts, EAT is home to eight infant, junior and primary schools in Norfolk and Suffolk, including its founding school, Costessey Junior. Mr Hull’s departure later this year will mark the end of an era – after two previous headships, he took over the school in 2002, guiding it through its conversion to academy status and overseeing EAT’s growth. On the way, he has become a well-known face in education – winning a national Headteacher of the Year award in 2010, becoming the longest serving National Leader of Education in Norfolk and holding roles on government panels and groups. But he said now was the right time to hand over – to give himself a break, and, potentially, a career change. The advert for his replacement attracted international candidates, he said, with a two-day “rigorous” assessment and interview process that saw Mr Adamson excel. With his departure now a reality, Mr Hull said he would miss the role, and was preparing to get his head around the change. “I will miss the personal interactions with children and colleagues,” he said. “This job is all about people and I will miss that. For Mr Adamson, whose previous role was an Executive Headship at Coltishall and Swanton Abbott primaries, he said applying for the Chief Executive role was an easy decision. EAT has recently welcomed Poplars Primary, in Lowestoft, and will see Nelson Infant, in Norwich, join later this year. With three good Ofsteds for its schools this year and a visit from the area’s Regional Schools Commissioner, Sue Baldwin last week, Mr Adamson said it was a “celebratory” time at the Trust. And while he said many schools were showing interest in joining EAT, rapid growth is not a priority. In another sign of EAT’s – and particularly Costessey’s – new chapter, later this year work will begin on a scheme to combine Costessey Infant and Junior schools onto one site. Mr Hull said education had changed “out of all recognition”. “The teaching role that I started in is nothing like what I see teachers doing today,” he said. His start in education came before Ofsted, exams for primary pupils and the national curriculum. “Teaching today is so much more focused on the child,” he said. “It used to be about the teacher, rather than the child. He said it did make education an interesting field to work in, something Mr Adamson agreed with.